To Bitly or Not to Bitly? That is a personal decision! 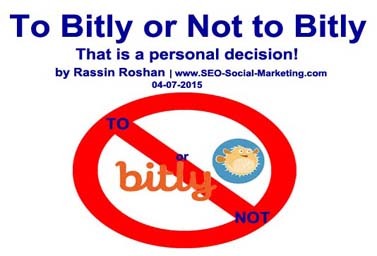 To Bitly or Not to Bitly is a question we all must ask ourselves! In today’s digital media communication platforms many people use their Universal Resource Locator (URL). However, at times the URLs can get long, and since some online platforms such as Twitter is character sensitive, each character is counted. Therefore using the original URL can take up most of the valuable real estate that is given for a short message. Yet, the URL will not reduce your character count on Twitter. Some people use www.bitly.com to shorten their long website addresses. Other’s like myself are a bit hesitant, and prefer other methods of shortening my valuable website link. Some SEO plugins, such as SEO Yoast or All-in-one-SEO, offer a get short link and preserves your actual URL and shortens the rest. For example, my page was http://seo-social=marketing.com/is-link-building-dead-in-2015 and if I must use a shortened version, then I prefer to use http://seo-social-marketing.com/?p=2089 . This way, my rich website address’s keywords are preserved and still usable. It is a personal call to shorten a long URL. BITLY is a good alternative for people who do not have a WordPress website and do not have access to SEO plugins. However, by using Bitly.com if the original web address was keyword rich, the owner of that Universal Resource Locator (URL) will lose valuable search properties. Majority of people who use Bitly.com do not pay attention, to some small details such as the slash ! No matter what link BITLY shortens, it automatically places a double slash. Please do not add additional slashes to the provided link. If you do, you just broke your perfect link! As the usage of bitly.com increases, so do the broken links! Some users either by habit, or just lack of attention, end up not only adding extra slashes to the link, but also adding an extra HTTP in front of the BITLY link. Then the user is surprised why their link did not work! Some ask what is the difference between HTTP and HTTPS? HTTP stands for “Hyper Text Transfer Protocol”. Second, HTTPS, stands for Hyper Text Transfer Protocol with security capability. You will see this abbreviation on bank web sites, and web sites that add an extra layer of security onto their company website. All you really need to know is, please don’t add any of these in front of your perfectly created BITLY Code. If you do, you will have a broken link that goes nowhere! I have seen many altered BITLY codes. Somehow people manage to place three (3) slashes, were by all they need to do is to copy & paste the shortened link into the destination location. No need to alter any character. Even today, we need to pay attention to our links. For any questions or comments please write us your thoughts.